That is, it’s easier to send black children to inferior schools if their schools are all on one side of town, and white schools are on the other. It’s easier to target housing and mortgage discrimination against blacks – one of the most important causes of the wealth gap – if all the black-owned houses are in one area. It’s easier to unleash abusive policing and incarceration practices on black communities without disturbing – or even attracting the attention – of whites for decades if whites and blacks don’t live in the same neighborhoods…. If this is why we care about segregation, then Silver’s measure – which doesn’t care which racial groups are mixing, as long as there is some mixing going on – is less useful. What matters then isn’t just integration: what matters is that privileged groups live in the same places as traditionally oppressed groups, so that place-based discrimination is made more difficult. In the United States, that means whites and people of color living in the same neighborhoods. Where that doesn’t happen – even if an area is integrated with, say, blacks and Latinos – then place-based discrimination is still viable, and it will be much easier to reproduce racial inequality. Interesting response, does it make sense to focus much more on black-white segregation rather than also on hispanic-white segregation? 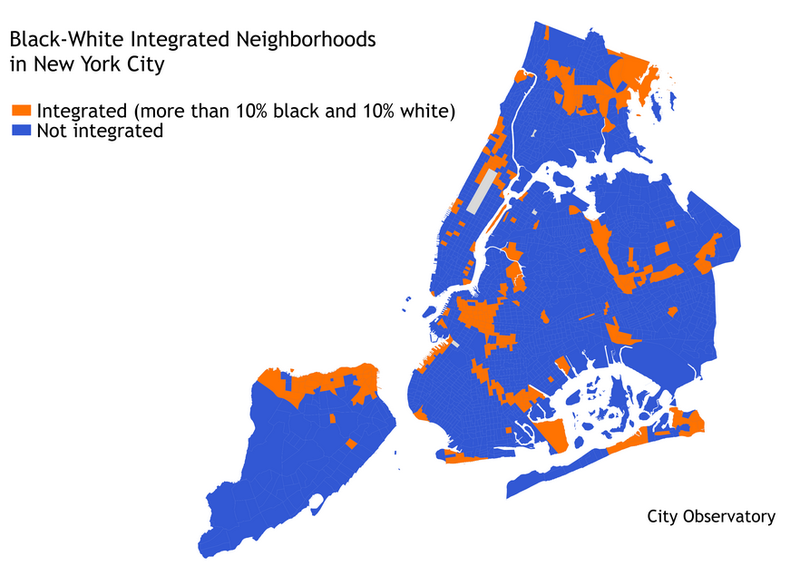 For historical reasons, black-white residential segregation gets more attention, but considering New York City has had for a while similar or larger hispanic than black populations perhaps it should be given more attention. And nationwide, the hispanic population is larger than the black population. The dissimilarity indices aren’t quite a comparable ranking: it breaks up NYC into several metro areas, one of which is mostly the city. Chicago is treated as one metro area. Nate Silver stats are just on city propers; though his site says metro-wide are being released this week. Interesting take. I imagine that Silver’s algorithm would rank Camden, NJ as being fairly integrated, since it completely lacks hyper-segregated tracts with 90+ percent majorities . Despite this, 95% of the city is Black or Latino and white people in the region would almost universally characterize it as a ghetto.